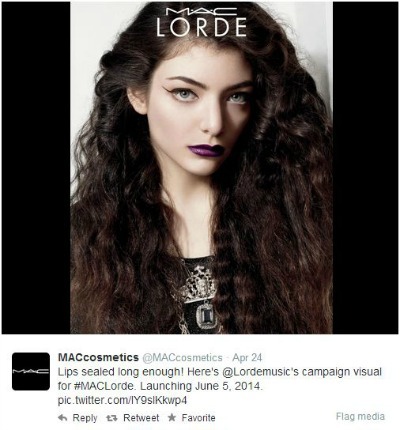 Lorde + MAC = an interesting beauty combination. MAC is giving us a sneak peek of the new lipstick they’ve created based on the dark, purple-y awesomeness that we’ve seen on Lorde. Those who are following the latest in lipstick news already know that Lorde mixed two MAC shades — Heroine and Cyber — to create what we saw on the Grammys. (Also at the Grammys — finger dip dying, which is great.) Now there’s a full-on makeup line launch that’s starting with the lip shade at right that’s called Pure Heroine, which is also the name of the singer’s debut album. The collection, out June 5, also includes a liquid eyeliner pencil. Lorde has clearly made her mark with an award-winning album, but it’s interesting that’s she’s also becoming a beauty icon. She’s made a point of actively rejecting the beauty rules that we’ve gotten accustomed to. First off, she’s known for wearing full outfits. While Lady Gaga and Miley Cyrus are running around without pants, Lorde wears trousers that are full and high-waisted. And she pairs them with large blazers. She made headlines with the pink 90s-style suit she wore on stage with Nirvana a few weeks ago. But with the exception of a sliver of midriff, she’s pretty well covered. More than that, she’s come out and said unabashedly that she doesn’t want you to go Photoshopping her up. Just a few weeks ago, she tweeted two photos taken at one of her performances — one retouched to make her skin look smooth and the other her real skin, unretouched. “Remember flaws are ok ;-)” she captioned. She’s spoken out time and again about the ways in which women are portrayed — too “perfect,” desperate for a guy’s attention — defining herself as a feminist. She’s walking the walk and by stripping away the artifice, she’s gained respect for her look and her point of view. MAC has a way of capturing the moment and choosing spokespeople who speaks to the beauty trend that, perhaps, you didn’t even know was happening. So it makes sense that they would choose someone who’s look is so unique. But it’s also clever to select a partner who has something singular to say about what beauty is in this day and age.